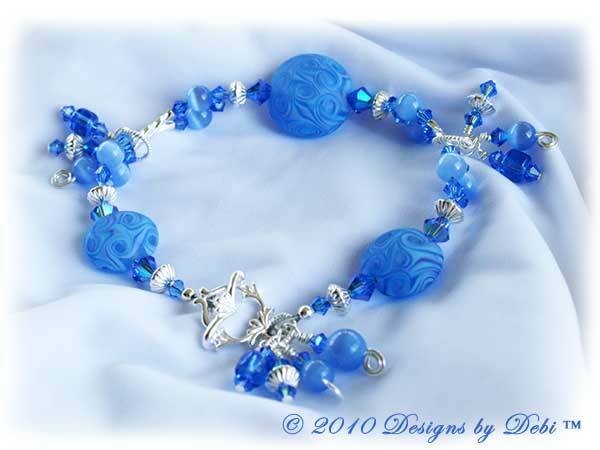 I began this piece with mesmerizing artisan lampwork beads handmade by Glenn Mincey of Benton City, Washington. 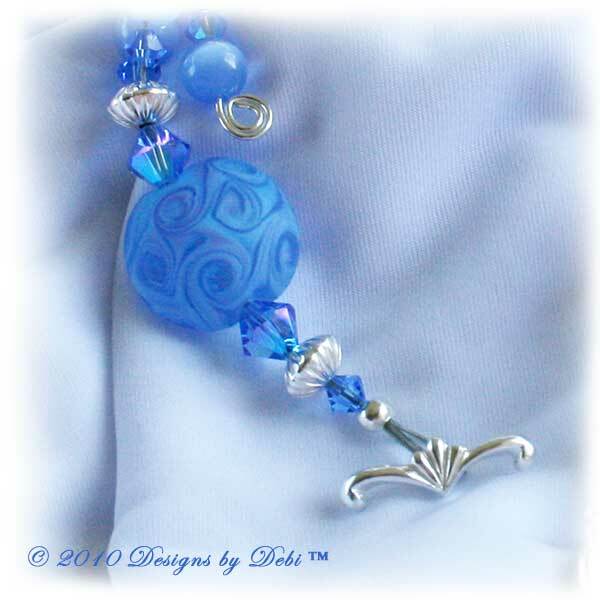 They are lentil shaped beads in beautiful shades of blue with a swirl pattern, hint of violet and etched for an awesome glowing effect. Swarovski Crystal sapphire AB2x bicones twinkling with hints of violet are a perfect match and are used throughout the piece along with sapphire bicones. Sapphire blue cat's eye beads, that change hue as they capture and reflect light, are interlaced with them along the 2 strands of the bracelet. Bright sterling Silver twisted double tubes and corrugated saucer beads were also used. 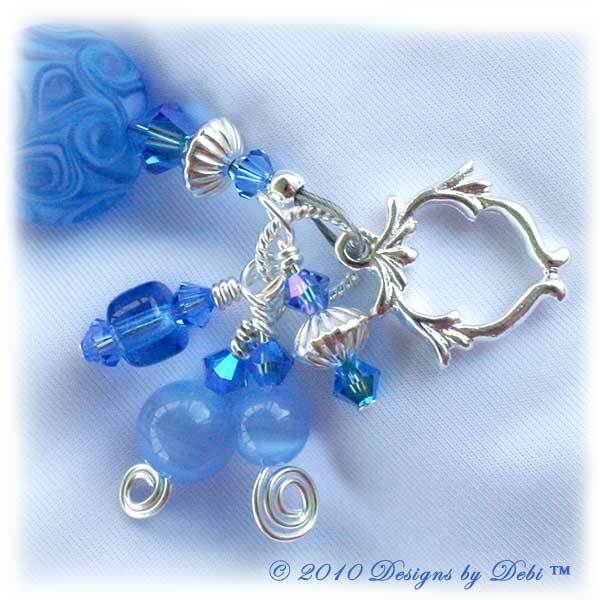 I made lots of dangling charms with cat's eye, crystals, blue glass and silver saucers incorporating a spiral twist on some to coordinate with the pattern of the beads and hung them from sterling silver twisted rings. The bracelet finishes with an abstract sterling silver toggle clasp. The charity I've chosen for this month, to receive the donation from this piece, is Autism Speaks. April is Autism Awareness Month. The Awareness Ribbon for Autism is a puzzle pattern in purple, blue, red and yellow and, although the colors do not match, if Autism is a cause that is special to you I can add the Awareness Ribbon charm to the bracelet at no charge. I decided to go with a blue color scheme in honor of Autism Speaks' Light It Up Blue Campaign. On the night of April 1, prominent buildings across North America and the world including the Empire State Building in New York City and the CN Tower in Toronto, Canada will be lit up blue to raise awareness for autism and to commemorate World Autism Awareness Day on Friday, April 2. Their goal is to light the world blue ­ city by city, town by town ­ to raise awareness about autism in our communities. So this is my way to "Light it up Blue." 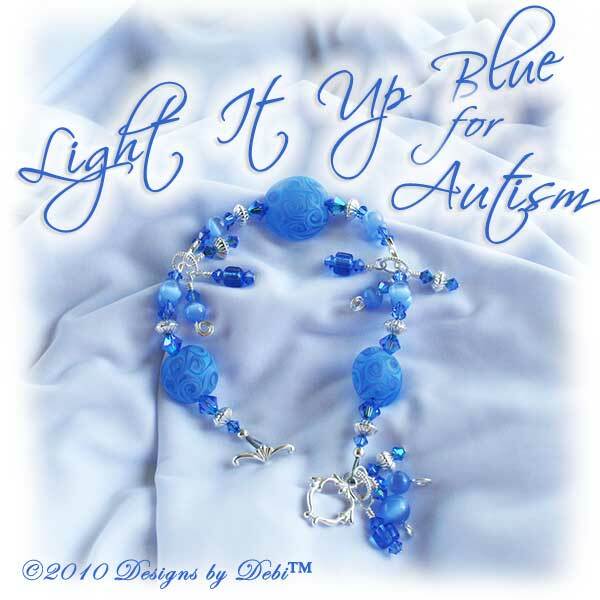 If you'd like ideas of how you can light it up blue, visit www.LightItUpBlue.org. Autism, part of a group of disorders known as autism spectrum disorders (ASD), is a complex neurobiological disorder that typically lasts throughout a person's lifetime. It is characterized by varying degrees of impairment in communication skills and social abilities, and by repetitive behaviors. Symptoms range from mild to severe. It affects the way a child perceives the world and makes communication and social interaction difficult. Autism affects 1 in 110 children and these numbers are growing by 10% - 17% annually. An estimated 1.5 million individuals in the U.S. and tens of millions worldwide are affected by autism. There is no medical detection or cure for autism and its cause is not known. Autism Speaks was founded in February 2005 by Bob and Suzanne Wright, grandparents of a child with autism. Since then, Autism Speaks has established affiliate chapters in the United Kingdom and the Middle East and has grown into the nation's largest autism science and advocacy organization, dedicated to funding research into the causes, prevention, treatments and a cure for autism; increasing awareness of autism spectrum disorders; and advocating for the needs of individuals with autism and their families. To find out more about Autism Speaks or to make a donation on your own, go to www.AutismSpeaks.org. 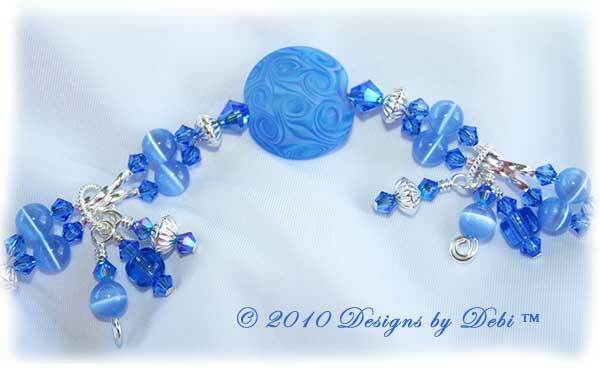 The bracelet measures 9 inches and will fit a 6 3/4 inch (very loosely) to 7 1/2 inch wrist. If you need the bracelet re-sized, please let me know at time of purchase and this can be done prior to shipment at no additional charge.